”Jetbull Casino is an an all-round operator that’s laced with top-dollar incentives, a stupendous game collection, tailored promotions and superb customer service”. Jetbull carries a Class 1 Maltese license. It is owned and operated by EveryMatrix Limited. With its Instant Play and mobile friendly software, the operator offers more than 900 games powered by the best software providers in the business. The site is as robust as they come and it’s refreshing to see an online casino, lottery, sports betting, virtual sports and mobile betting-a one-stop betting shop if you will. The game library is made up of a myriad of slots machines (old time classics, 3D, three and five reel varieties), towering jackpots, video poker, speciality games, and a live casino. Jetbull does a sterling job in this department since it replicates the floor of a brick and mortar casino. To be honest it’s virtually impossible to play every single game that’s listed. To kick start your online gambling foray, Jetbull offers you a ”no frills” bonus of 100% up to €150. To unlock the bonus a deposit of €10 is all that’s needed. The bonus is entirely optional. Keep in mind, if you do accept it, there’s a play-through attached to it that must be completed first before a cashout is allowed. In the best interest of fair play, the deposit and the bonus sum must be rolled over 30 times (60xb). Although I’m impressed with the bonus size the wagering terms does not float my boat. 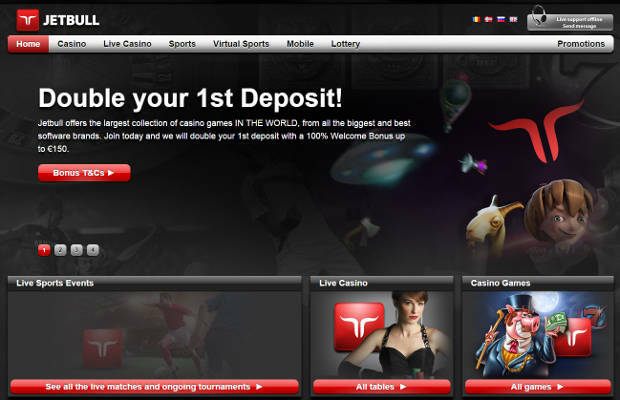 All slots machines count 100% towards the completion of the bonus wagering. If you want to read more about how the play-through requirements work this article provides a superb explanation on it. When can I cash out? Let’s assume you deposit 100 credits, Jetbull will double your initial deposit (100% match bonus), play with 200 credits. Before you can cashout you must turn over 60x€100=€6,000. That’s if you play slots. The following games contribute 10%: Tens or Better Progressive, Red Dog, Tens or Better, Pai Gow Poker, Bonus Deuces and Golden Derby, Jackpot Poker. *Table game variants such as Roulette, Blackjack and Baccarat contribute 1%. It goes without saying that the bonus is slots centric. If you do use the bonus to play Blackjack you must stake €6,000/1%=€600,000. 1. You are not allowed to play the following slots: Devils Delight, Scrooge and Wish Master. 2. You are not allowed to wager more than 10% of the bonus funds. If you do so the bonus and associated winnings will be void. 3. Different games are weighted individually towards the WR. 4. Players from the following countries do not qualify for any bonus offers: Bulgaria, Canada, Croatia, Greece, Hungary and Romania. 5. Once you’ve accepted the bonus it will expire after 30 days. 6. The maximum winnings from the bonus is €10,000. To be honest this is a sloppy term. *Due to the steep wagering restrictions attached to the bonus (60xb), we’ve awarded it the court jester badge. We have sent casino management a note to lower it. If they comply the badge will be removed. Jetbull does not accept players under the age of 18. The operator adheres to a strict gaming policy. If you’re prone to wager more than you intended to, you’re more than welcome to drop the casino manager a self-exclusion note? How does it work? You can request a ”cooling off period” for a few weeks, up to 6 months or indefinitely. If you have one eye on your budget the operator allows you to set your own deposit and session limits. You decide how long you want to play and how much cash you want to wager within a given period. Jetbull’s staff is ready to answer your ”beck and call” 24/7. They can be contacted through live chat or email. Unfortunately no telephone numbers are listed at the website of the casino. If you’re a newbie I suggest you take a quick tour of the FAQs. It gives a rundown on how to register and account, deposit and withdrawals, security, currencies accepted, how to claim a bonus and so forth. The operator also received the ”Best Customer Service” award in 2014. I can guarantee you that your account details stays under lock and key at all times. Maybe I’m getting ahead of myself here. The casino states that it uses the latest encryption software the best that money can buy. As such it merits my vote of confidence in this department. In summary. With its robust game library, quality rewards program, exquisite customer service and fast payouts; Jetbull is among the top-echelon of online casinos. The only caveat I have is the steep wagering requirements and the max. win of €10,000 of the bonus. Other than that I highly recommend it. When you click on the ”Promotions” tab on the top right-hand corner of the site, you’ll see the various promotions on offer. I’ve already covered the sign on bonus. Reload Bonus: You’ll receive a weekly reload bonus of 35 credits, the bonus can be taken any day of the week which is great. Sports Welcome Bonus: New punters receive a sports betting bonus of 50% up to €75. Terms and conditions apply. Rewards Program: As a regular depositor what can you expect? Since Jetbull adheres to the following policy: ‘‘The more you play the more we pay” you’ll earn comps on selected games. Once you’ve accumulated 200 points your points can be exchanged for cash. How do I claim my points? 100 Points equals 1 credit. *Different games have different rates. For instance, games like Gonzo’s Quest, classic slots, scratch cards and other games earns at a rate of 20%. Therefore, for every 10 credits wagered you’ll earn 2 points. To stay on top of the latest promotional offers check your Inbox regularly. Jetbull offers a stupendous amount of deposit methods. You can use one of the following: Bank Wire, DineroMail, Diners Club International, Direct Bank Transfer, Dotpay, EcoPayz, Entropay, Fast Bank Transfer, Laser, Solo, Visa Electron, InstaDebit, Przelewy24, iDEAL, Sofortuberwaisung, Nordea, eNETS, GiroPay, EPS, Dankort, Abaqoos, Euro6000, Boleto, Swedbank, eKonto, CartaSi, Moneta, ePay.bg, Euteller, u net, Neosurf, Teleingreso, Multibanco, Maestro, MasterCard, Neteller, Paysafe Card, Postepay, Skrill, dotpay, EC-ELV, FundSend, Instant Bank, Lobanet, Mobile Deposit, QIWI, Skrill 1-Tap, Switch, Todito Cash, Trustly, TrustPay, Ukash, Visa Debit and WebMoney. The following currencies are accepted: British Pounds, Chinese yuan, Czech Republic koruna, Danish Kroner, Euro, Norwegian kroner, Polish zlotys, Russian rubles, South African Rand, Swedish krona, Romanian lei, South Korean won and US Dollar. *The maximum daily deposit and withdrawal limit is €5,000. Before you can initiate a withdrawal request you must provide the necessary verification documents first. Copy of your ID Book, Passport, latest utility bill and bank statement (not older than 3 months). Withdrawals through e-wallets takes up to 48 hours, credit and debit cards 4 to 5 days and bank wires up to 5 days. Let’s be honest here there’s no way I’m going to list each individual game. With a total game library of 900 games from various software providers )Betsoft, IGT, Euro Games Technology, EveryMatrix, iSoftBet, IGT, Microgaming, NetEnt,IGT (WagerWorks) and OMI Gaming). I’m only going to list the popular ones of each. Basically there’s a game for every player taste. The NetEnt slots lead the pack followed by Microgaming, Betsoft and IGT. They’re flushed with colourful and eye-catching graphics, pin-dropping audio, bonus rounds, scatters and wilds. Popular titles include Jack Hammer (NetEnt), Jack and the Beanstalk (NetEnt), Game of Thrones (NetEnt), Starburst (NetEnt), Imperial Wars (EGT), Crazy Cows (GO) and Heavy Metal Warriors (ISB). I might add that some of the slots are relatively volatile, if they payout they do so quite handsomely. If you’re not into slots machines you can play table game variants like baccarat, blackjack and roulette. Video poker favourites like Jacks or Better, Poker Play, Deuces Wild are just some of the games that grace the menu. If you’re not sure how to manage your bankroll when playing slots you can read more about it on this page. If you’re a serious high-roller you can start off by giving the 7-figure progressive jackpots a shot (49 in total). Just a heads up they’re very volatile. Popular progressives in this category are Mega Fortune (Microgaming), Hall of Gods (NetEnt), Treasure Room (Betsoft), Gold Rush (NetEnt) and Icy Wonders (NetEnt). Suffice it to say this is where the real action is. You can play your favourite table games like baccarat, blackjack and roulette against well-trained and professional live dealers. So, what’s the catch? There’s no catch mate. The games are interactive and streamed to your PC via webcam from a live studio. What I like about the live games is that you can play them at your own pace.